This morning, Amazon tripled its Alexa-ready devices with the announcement of two new products, the Amazon Echo Dot and Amazon Tap. The Echo Dot is very much just a smaller version of the original Echo, while the Tap is a portable Bluetooth version, made for on-the-go or around-the-house-moving tune listening and task completing. With the new Echo Dot, Amazon has taken the style and shape of the original Echo and shrunk it down into puck form. The Echo Dot has a speaker, but it’s not necessarily supposed to be used for music on its own. Instead, Amazon is hoping that you’ll attach it to other speakers (via Bluetooth or included cable) to bring the power of Alexa to other products. Amazon is also positioning Echo Dot as a room companion that gives you Alexa’s voice controls over lights, alarms, thermostats, timers, etc., without the bulk of the bigger Echo. The Echo Dot is priced at $89.99, is an exclusive to Prime members, and can only be purchased at this time through an Amazon Echo. You need to say to your Echo, “Alexa, order an Echo Dot.” Seriously, that’s the only way you can order one. 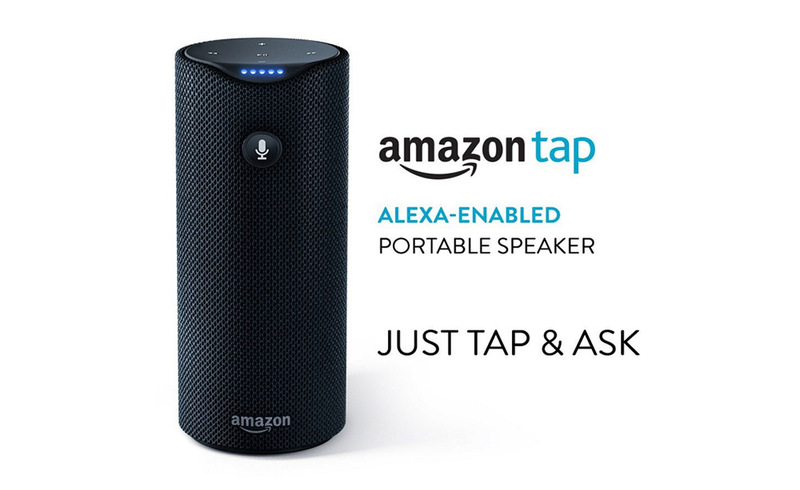 The Amazon Tap is very much a full-blown speaker, only it’s portable. It charges via included cradle, but once charged, you should see up to 9 hours of music playback. Like the original Echo, it features 360º omni-directional audio, improves constantly via over-the-air updates, and harnesses all of the power of Alexa, when connected to WiFi. When you aren’t on WiFi, it turns into a Bluetooth speaker in tube form. The Amazon Tap is available for pre-order today at $129.99 and ships March 31.